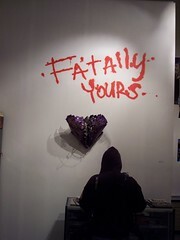 Check out all the dope paintings hanging at the gallery throughout the month of February, 2008. This is a very fun exhibit with very affordable pieces from artists all over the globe. If interested in some of the work just hit us up for prices and stuff.